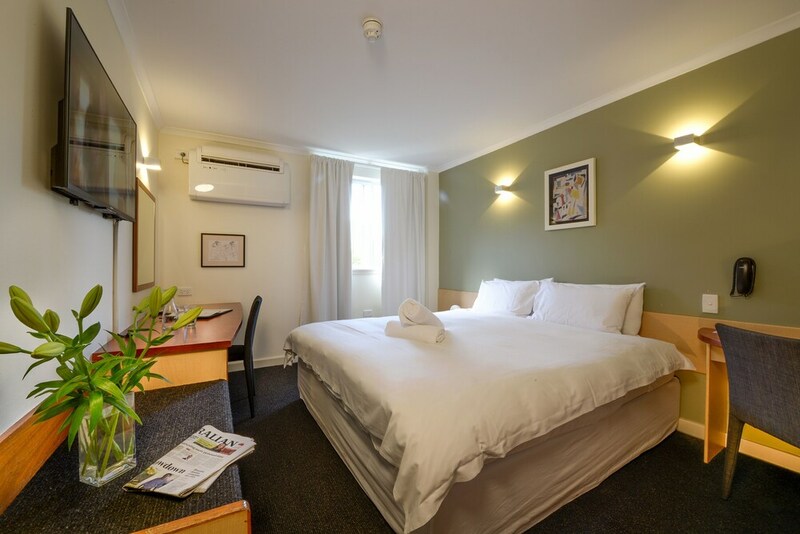 In the heart of Perth, Sullivans Hotel is within a 5-minute drive of Perth Convention Exhibition Centre (PCEC) and Elizabeth Quay. This hotel is 2.7 mi (4.4 km) from Kings Park and Botanic Garden. Make yourself at home in one of the 71 guestrooms featuring refrigerators. Your pillowtop bed comes with Egyptian cotton sheets. Digital television is provided for your entertainment. Private bathrooms with showers feature complimentary toiletries and hair dryers. Enjoy recreation amenities such as an outdoor pool or take in the view from a garden. This hotel also features complimentary wireless Internet access, tour/ticket assistance, and a reception hall. Satisfy your appetite with Mediterranean cuisine at Sullivans Cafe, a restaurant which features a bar and a garden view. Dining is also available at the coffee shop/café. Continental breakfasts are available daily from 6:30 AM to 10:00 AM for a fee. Sullivans Hotel features an outdoor pool and complimentary bicycles. Dining options at the hotel include a restaurant, a coffee shop/café, and a snack bar/deli. A bar/lounge is on site where guests can unwind with a drink. A computer station is located on site and wireless Internet access is complimentary. Sullivans Hotel is a smoke-free property. Sullivans Cafe - Overlooking the garden, this restaurant specializes in Mediterranean cuisine and serves breakfast, lunch, and dinner. Guests can enjoy drinks at the bar. Open daily. Sullivans Bar - Onsite bar. Open daily. This property's policy is to refuse certain bookings for the purpose of group events or parties, including pre-wedding stag/bachelor and hen/bachelorette parties. Pool access available from 7 AM to 9 PM.Children 17 years old and younger are not permitted at this property. Only registered guests are allowed in the guestrooms.